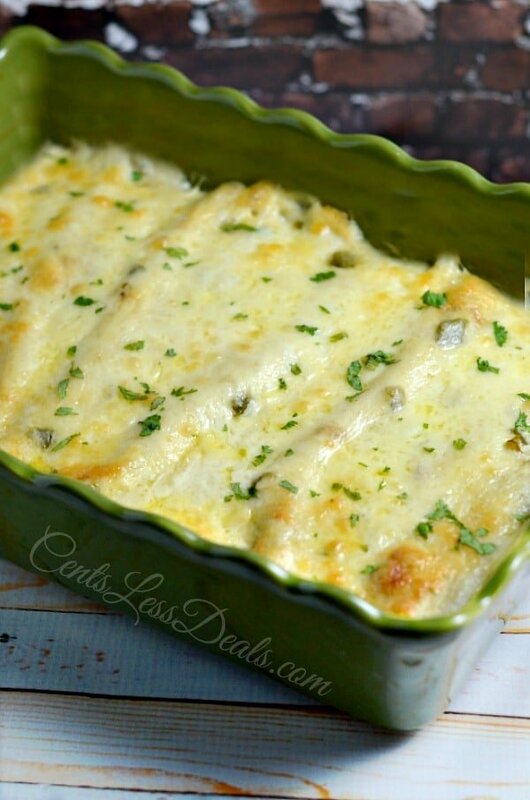 Sour Cream Chicken Enchiladas are rich, creamy and easy to make! Tender juicy chicken, onion and loads of cheese are wrapped in flour tortillas and smothered in a simple homemade sour cream sauce, topped with cheese and baked until brown and bubbly! I’ve never met an enchilada I don’t love but I have to admit, this recipe for sour cream enchiladas is probably my favorite recipe of all time. When I was a little girl my mom would make these for me, and it’s something my kids always beg me to make for them too! 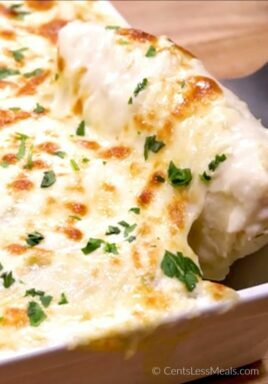 These enchiladas have a shredded chicken filling rolled in a soft flour tortilla and are smothered in a simple and creamy sour cream sauce. 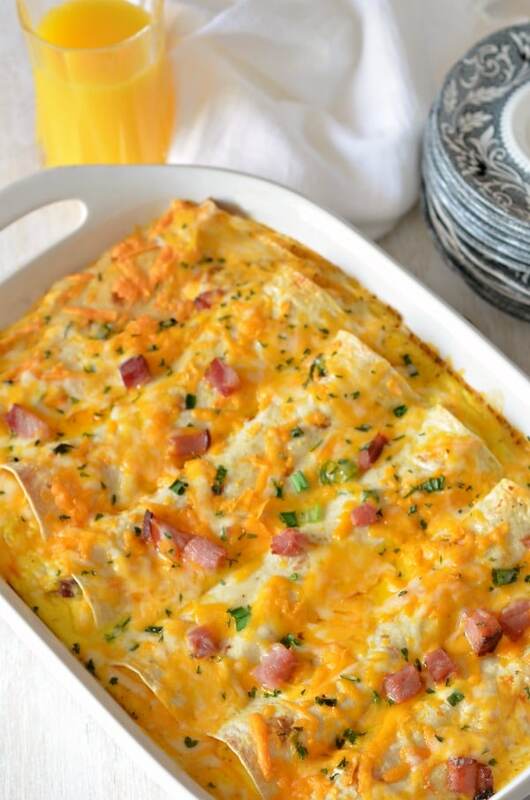 A layer of monterey jack cheese is sprinkled on top and the whole casserole is baked until hot and bubbly. This delicious meal is the ultimate comfort food and one dish your family will request over and over again! The best part about this recipe, is that it’s really easy to make (and I’m all about easy in the kitchen). I start with flour tortillas (you can most certainly replace them with corn tortillas if you prefer) and then create a simple from scratch sour cream sauce. Don’t let the words “from scratch” scare you away from this recipe, the sauce is not only easy to make, it’s really quick, creamy and delicious! We sometimes add in a couple of ounces of cream cheese if I have it on hand and stir until hot and melted before adding the sour cream. This recipe works well with either regular sour cream or light and of course we love that it’s made without cream of chicken soup. 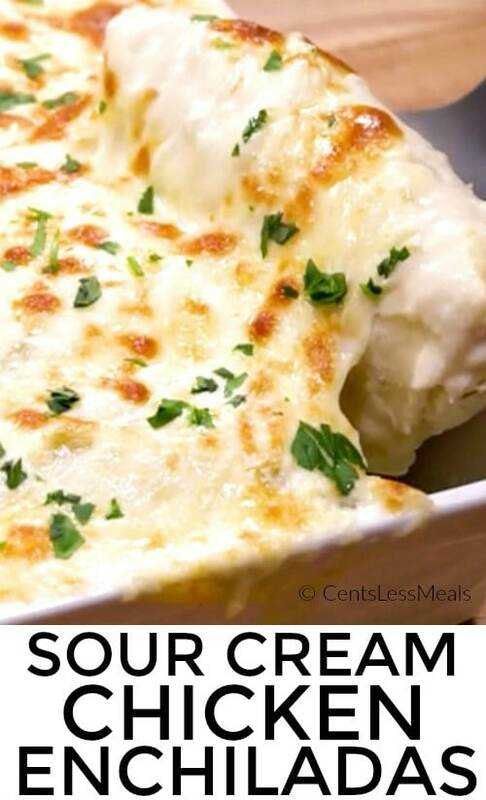 You’ll want to be sure to turn the heat down to low before adding the sour cream so it doesn’t curdle. If you’d like to add a little bit of extra kick and zest to this recipe, you can also add in a can of Rotel tomatoes to either the sauce or the filling. We love the flavor it adds! I sometimes sneak veggies into the filling to stretch it out a little bit or to use up extras in the fridge. For the filling in these chicken enchiladas, you can use rotisserie chicken or leftover chicken breasts (we sometimes even use Slow Cooker Taco Shredded chicken in these which adds amazing flavor as well). 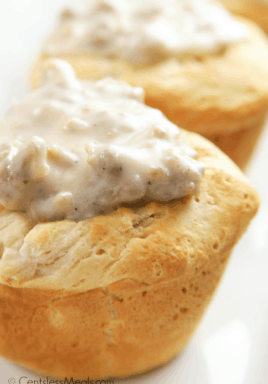 If you prefer, these are also great made with lean ground beef. If you prefer a milder onion flavor, you can cook the onion a little bit in some olive oil before adding it to the chicken. I love spice so I also add chopped jalapeno in mine. Once baked we add our favorite toppings such as cilantro, black olives, tomatoes, green onion and fresh jalapenos and serve this with slow cooker corn on the cob and refried beans or Mexican rice. Sour Cream Chicken Enchiladas are rich, creamy and easy! Chicken, onion and cheese are wrapped in flour tortillas, then topped with a cheesy sour cream sauce and baked to golden perfection! Melt butter in a saucepan over medium heat. Stir in flour and cook for about a minute or until golden brown. Slowly add chicken broth and whisk until completely smooth. Cook over medium heat until thick and bubbly. Turn heat to low. Stir in sour cream and green chiles. In a large bowl combine chicken, onion, and 1 cup of cheese. Place 1/3 cup of chicken mixture in the middle of each tortilla, roll up and place into baking dish. Pour 1 cup of sauce into a 9x13 baking dish. 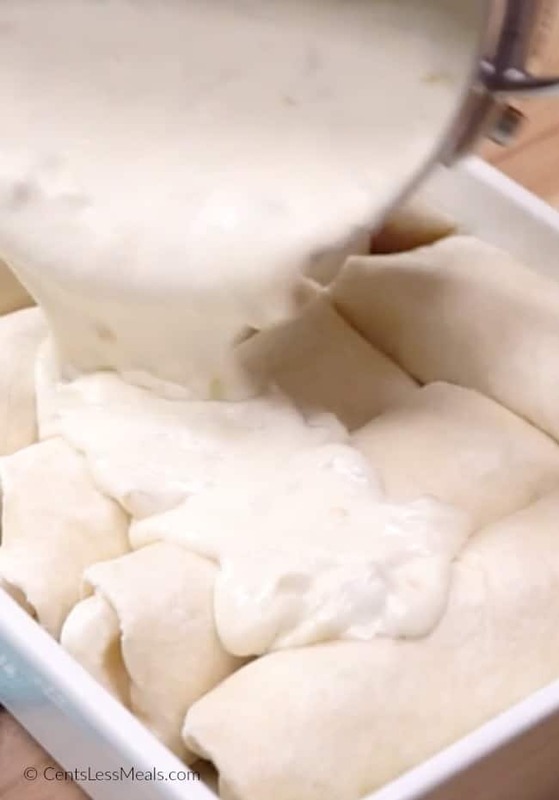 Place chicken rolls in the baking dish. Pour remaining sauce over the top of the tortillas in the dish. Top with cheese. Bake at 350 degrees for 20-25 minutes or until browned and bubbly. I definitely recommend sauteing the onions before putting in the oven. As mine were not cooked either. Mine is the crunchy onions, this was a yummy recipe. That sounds like a great option Sara! These aren’t enchiladas, they’re burritos. Enchiladas are made with corn tortillas. Burritos are made with flour tortillas. I’ll try it both ways tonight and see which is better. Looks delicious as a burrito! Sooooo dang yummy! I took a few liberties because I didn’t have those exact ingredients, but I’ll definitely be making these again. Thank you so much! I mixed 4 cups minute rice, 1c. Petite diced tomatoes with green chilies, 1.5 cups chicken broth, 1 can Queso Blanca sauce, .5 can of corn and poured it all into the 9×13 pan. I then prepared the enchiladas as directed and placed them on top of the rice. Than followed the rest of the recipe, And cooked as directed. Easy one dish complete meal. Sounds yummy Chanin! Thank you for sharing! These are pretty good but why doesn’t the recipe create so much sauce if we only use one cup? I’m over here trying to maximize but waste. I understand I am now able to have left over sauce but I don’t need have leftover stuff to make this again. In step 5, it says to pour remaining sauce over the top of the tortillas in the dish. Hope that helps Alyssa! I have this in the oven right now. I had to modify due to what I had on hand… shredded pork roast, turkey stock, banana peppers from the garden, some enchilada seasoning, and sharp cheddar. The picky kids have been sampling as I put it together and are anxious to dig in. So am I!!! All of that sounds so delicious Andi! Thank you for sharing and enjoy! Very nice recipe. I will definitely make again with corn tortillas. I love a Lot of the other ideas i am reading as well. This was really, really good and my meat and potatoes 85 year old dad even thought so! I put a couple of tablespoons of diced jalapeños in sauce. Added just a little more zing but not too much for mild eaters. That’s so great to hear Lesia! Glad your family loved this recipe! Sauce was excellent, prep time was more than 15 minutes (30 minutes). I used the flour tortillas but I’m thinking next time I might try the corn. The tortillas were a bit gummy and when eating for leftovers they were even more gummy. Will definitely try again though. Thank you. You’re welcome Shelly! The two tortillas will give different textures. I have only tried it as written, but some readers have had success with freezing. Sarah said she froze half (a small pan), let the enchiladas defrost on her counter for an hour and baked them covered at 350 for 25 mins, and then browned the top. Good luck Mary! Love this for an easy uncomplicated meal. I add a little fresh salsa on top too. Delish! Absolutely our new favorite! I opted for pepper jack cheese instead of the green chiles and Mont jack cheese, as that is what I had on hand. So, so yummy! Sounds delicious Nancy! Glad you loved it! This is dinner tonight, but I can’t find an answer to what size tortillas to use?? Since I don’t see a full size picture, I can’t use the 9 x 13 pan and enchilada positions to estimate the size. Anyone remember what they used? I have small and medium…. Needs twice the sauce. Added a block of cream cheese to the sauce, and carmelized onions made it amazing! Sounds delicious! Gotta try this!! I made this recipe, twice now. It’s delicious! The only thing I do is instead of putting the green chiles in the sour cream sauce, I add to the chicken mix. I also garnish with fresh cilantro after removing from oven, I really love cilantro. It is so amazing. I just really enjoy the taste of the sour cream sauce as is without chilies. Definitely recommend this recipe. So glad I found it. These were quite wonderful! My husband (who isn’t much of an “eater”) came back for seconds and thirds. I added a can of black beans and about a cup and a half of frozen sweet corn to the chicken to provide some extra substance and veggies. I made two half pans of enchiladas and froze the other half for a quick meal another night. When we decided to bake up the frozen half I let the enchiladas defrost on my counter for about an hour and baked them at 350 for about 25 mins covered with foil, and turned it up to broil for a couple mins to brown the top. Delicious! More like a baked chicken burro (flour tortillas change it) but they look good. Going to ad some strips of green chili, black olives and Cilantro when I make ghee. My favorite. Can’t wait to try it! Have you used corn tortillas instead of flour? The sauce sounds delicious. Can this be frozen and then baked? Looks so good! Would corn tortillas work? I made this tonight for dinner and it was wonderful! I had a ‘go to’ recipe for chicken enchiladas that was very time consuming and complicated, and I can happily say that this will be taking the old recipe’s place. 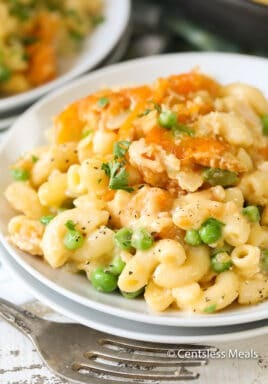 This is easy, fairly quick (as long as I can keep the kids out of the roasted chicken), and has a really great flavor! Thank you!! These were delicious! I added some shredded cheddar to the top before baking..added a little more flavor. Thank you for this recipe. 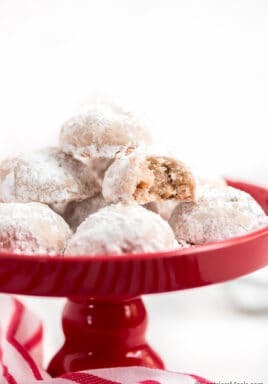 Is there anyway to print this recipe? My computer won’t even let me copy the text so that I can print it to keep. Is your page set up to not allow copy/paste? Made these for dinner tonight and they were delicious. Thank you.